Sounds like a funny thing to say, doesn’t it? But it’s true. 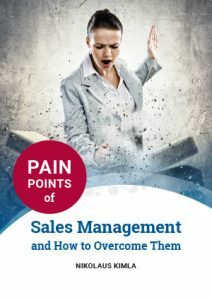 Of all the many pain points for a sales manager—and our research has turned up dozens—the first and foremost of these is the sales manager himself or herself. I’ll walk it back to how I came to this conclusion, so you can follow the same logic I did. Let’s take a look at a whole other game: football. Let’s look at the biggest game in football—the Super Bowl. Now, what if the coach of a team in the Super Bowl had to constantly harangue his team members, just in order to motivate them to play the game? Yes, you’d think that was pretty silly. Any team that has made it to the Super Bowl is going to be plenty motivated to play that game—it will be up to the coach to provide particulars as to plays and so on, but there will never be an issue of motivation to play. Why is such motivation never needed in the Super Bowl? Because motivation is built right into the system of the game. Not only is it an extreme honor to play major league football, it is doubly so when a team makes to the Super Bowl, and it pays extremely well on top of all that. No player that makes it to that level is going to need “motivation” just to play. Now let’s bring it back to sales: What must be wrong if a sales manager is constantly having to “motivate” their sales team? Well, in football it isn’t the coach that motivates the players to want to play—it’s the game itself. Or, put another way, the system. The same is true in sales: if the sales manager is constantly having to motivate salespeople to sell to their full potential, there is something wrong with that system. But there is yet something else behind that system—a causative agent that can change and even create that system. Can you guess what that is? That would be you, the sales manager. You as a sales manager have a certain mindset. You are receiving data about your sales team—but you are perceiving that data through that mindset. That mindset is going to affect the system and all the other elements of sales management. For example, going back to the sales managers we spoke with as part of our research, they obviously think that salespeople are going to do the least amount of work for the most amount of reward. With such a skewed mindset on salespeople, they could very well put a system into effect that “demotivates” salespeople. This mindset would also affect their use of technology, in that they would demand of technology that they constantly know what their salespeople are doing, all the time. It would affect their management and leadership style as well. It could even affect the commission and incentive structure—with a low enough opinion about salespeople, one could think that they “don’t deserve” high commissions or great incentives. But let’s pull it back once more: is that viewpoint expressed by the sales managers we spoke with so generally true? Are salespeople really that bad, or that lazy, that nearly a whole team would require constant motivation? First comes the mind maps, perception or conviction—then comes the system. In our company, we have never found that to be the case. We have found that people, in their basic nature, are good, really want to do good jobs, and will. From this perception, we have created a system—for onboarding, training, commissions, incentives and the whole sales structure—that our salespeople are very happy with. Pipeliner isn’t the only one to operate from this conviction. One of the sale managers we interviewed told us that, at one point, when he knew he had a really good sales team, he went to management and demanded an extra 1 percent for himself, when quotas were met. Management agreed. He then went back to his salespeople and told them that whenever a quota was met, he’d be getting an extra 1%—and that 3/4 of that 1% would be divided amongst the sales team. Did his salespeople need any more motivation to sell? No, they did not! That sales manager just sat back and watched them run to make their quotas. So it’s obvious that first comes the mind maps, perception or conviction—then comes the system. So the first thing you very possibly may need to do, as a sales manager, is change your own thoughts regarding salespeople, from more negative to more positive. To quote an old, but in this case appropriate, cliché, it’s changing from a “glass half empty” to a “glass half full” type of viewpoint. Let’s point out that a more positive mindset will also affect other aspects of your sales management—such as your management or leadership style, the way technology is utilized, and much more. So such a change can have broad implications. But realize this: sales manager pain point #1 might very well come back to you—the sales manager! And we’re here to help you totally change that.